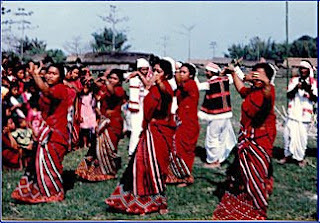 The Mishings are an ethnic group inhabiting the districts of Dhemaji, North Lakhimpur, Sonitpur, Tinsukia, Dibrugarh, Sibsagar, Jorhat and Golaghat of Assam. A few live in and around Pasighat of East Siang district of Arunachal Pradesh. They were earlier called Miris, to which they take offence now. However the Constitution of India still refers them as Miris. The Mishings are closely associated with the Adi people of Arunachal Pradesh. The Mishings belong to the Tibeto-Burman clan of the Mongoloid race. It's not known exactly where they migrated from, but it is believed that they were dwellers of the hills of present day Arunachal Pradesh. This explains the cultural and linguistic similarities they have with the people of the Adi (erstwhile Abor) tribe, and to some extent of the Hill Miri and Nyishi tribes of Arunachal Pradesh. Somewhere around the 13th century, they started migrating towards the plains of Assam, most probably in search of fertile land. This exodus continued for at least 2-3 centuries. As fate would have it, they found one of the most fertile river-beds (that of the mighty Brahmaputra) and settled on both banks along the length of the river, starting right from Sadiya in the east, to Jorhat in the west. They continued their practice of living in thatched houses raised on bamboo stilts, known as 'Chang-ghar'. It was a protection against flood waters during the rainy season, although the original logic behind raised houses was protection from wild beasts.Agriculture being their main occupation, floods affect them in more ways than one. Moreover, due to their affinity towards living close to river banks brings about Malaria and water-borne diseases. But 90% of them still continue to live along the banks of Brahmaputra and its tributaries, unfazed by the disasters striking them. 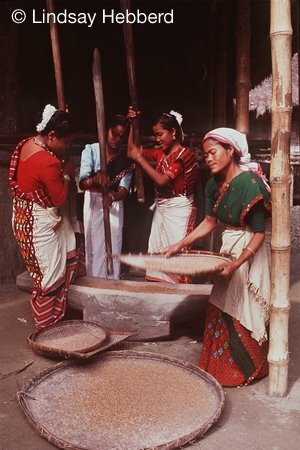 Their chief festival is Ali-Aye-Ligang, in the month of February, which celebrates the agricultural harvest. Most Mishings follow both the Donyi-Polo and Hindu religions, and there are a few Christians ( mainly in Majuli ) who follow the Catholic or Baptist faith. The language of the Mishing people is also known as Mishing language.Mishing surnames reflects the clan (o:pc)they belong to. They can be divided into three main clans: Pegu, Doley and Morang. This is a social setup. Marriage take place outside the group i.e between Pegu-Doley, Pegu-Morang, Morang-Doley. This depends on where the society is located i.e. Dagdoong (North) or Daktok (South).